It is rather ironic that individuals that exercise to improve their health often fall victim to sports drinks after a well-intentioned workout session. Luckily, there are natural sports drinks you can make instead. But, what are sports drinks, and what is purpose of them? Sports drinks are marketed to athletes for rehydration, and to replenish the body’s electrolytes that are lost during sweating. Athletes also burn more energy during exercise, and sports drinks provide a higher carbohydrate intake in a convenient bottle. Although replenishing electrolytes and increasing carbs after a good workout are important, the last place you should turn to is neon-colored sports drinks. Popular sports drinks are heavily flavored with sweeteners, especially high fructose corn syrup (HFCS). HFCS contributes to several health problems, including high cholesterol, blood clot formation, abnormal weight gain and obesity, type 2 diabetes, liver fibrosis, and decreased brain function. It takes a lot for the body to process refined sugar, and in the process, the body depletes itself of key nutrients like zinc, manganese, and B complex vitamins. If the body lacks enough of these nutrients, over time, this leads to the inhibition and reduction of insulin sensitivity receptors on the cells. As a result, drinking those unhealthy sugary drinks causes sugar to remain in the bloodstream, which leads to the creation of advanced glycation end-products (AGEs). These are substances that damage tissues in the joints, skin, eyes, and arteries, and have been proven to play a role in type 2 diabetes and cancer. And, that’s not all you need to worry about. Sports drinks also contain a number of processed sugar and artificial ingredients, including dextrose, citric acid, glucose-fructose, sodium citrate, sodium chloride, sucralose, zinc gluconate, acesulfame potassium, genetically modified organisms, and monopotassium phosphate. They also contain the flame-retardant brominated vegetable oil, fractionated palm kernel oil, artificial flavors, and artificial colors like blue 1 and red 40. Let’s take a look at the health effects of a few of these ingredients. You may know food coloring is not good. What you may not know is that food coloring can negatively affect the liver, brain, and DNA. Studies also show that ADHD symptoms improve when artificial food coloring is removed from the diet. Why is oil in your recovery sports drink? It is used to stabilize the artificial flavors and colors. No safe amount of brominated vegetable oil should be included in any diet. Period. It is known to cause memory loss, mental fatigue, tremors, muscular weakness, and slurred speech. Monopotassium phosphate and sodium citrate are food preservatives. They both lower your body pH and create an acidic environment inside the body. As a result, the body taps into its magnesium and calcium reserves to buffer the acid in the body, and restore its pH to normal levels. Low magnesium and calcium levels will put you in danger of osteoporosis. Many sports drink companies have you believe that you cannot manage electrolytes without their product. That being said, electrolytes don’t come from commercially-produced sports drinks. Electrolytes are simply minerals that include calcium, magnesium, phosphorus, potassium, and sodium. They are important because they help regulate the body’s hydration levels and the blood’s pH, rebuild damaged tissue, and maintain optimal nerve and muscle function. You can find electrolytes in whole and natural foods, such as course sea salts, coconut water, berries, lemons, limes, and other citrus fruits. That is why they are perfect ingredients for natural sports drink recipes. Making natural sports drinks is actually very simple. You will combine foods and electrolytes with a little bit of natural sweeteners like maple syrup, honey, or stevia liquid. This way you replenish the body with electrolytes, while still getting an energy boost after your workout in the form of natural sugars. The following are five natural sports drinks that will truly benefit the body. 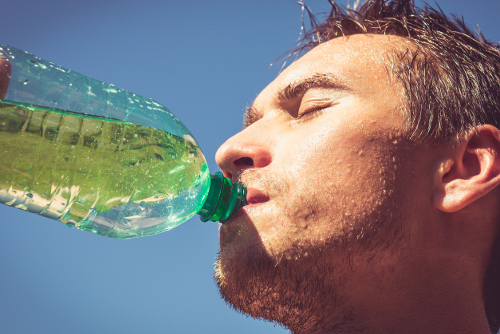 The following sports recovery drink is perfect after a hot yoga class or intense workout. The sea salt will replace electrolytes, while the dates provide a slow-burning sugar source. The citrus in the drink will help with liver detoxification, and the ginger is good to reduce digestive issues like gas and bloating. The following recipe will make three cups of natural recovery drink. Place all the ingredients in a food processor or blender, and let it stand for 10 minutes. Blend on high speed until smooth. The following adaptogenic sports drink recipe contains the adaptogenic herb called holy basil, which is also called tulsi. It helps the body handle and adapt to stress. Adaptogenic herbs like holy basil can help increase mental performance, cognitive function, and endurance. It will also improve sleep, boost immunity, and support healthy adrenal and thyroid function. This sports drink recipe also provides energy with honey, and the sea salt provides electrolytes and other trace minerals. This sports recipe will make eight cups that will easily keep in the fridge for about a week. Boil the water, and add the tulsi tea. Let it steep for 10 to 20 minutes. Let it cool to room temperature before adding the honey. Mix is some salt and minerals. Sip it slowly during your workouts. Grapes are loaded with electrolytes, especially potassium. This recipe also focuses around coconut water that contains easily digested carbohydrates in the form of natural sugars and some electrolytes. Coconut water is a high-electrolyte beverage that contains potassium, magnesium, calcium, and some sodium. Place all ingredients into a blender, and mix on high for a few moments. Pour it into a reusable glass water bottle, and keep it in the fridge until you are ready to workout. Shake it prior to drinking. Are options important to you? Maybe you had enjoyed a blue neon sports drink, and a bright yellow neon sports drink next. Luckily, there are plenty more options for you that don’t include artificial flavors and sweeteners. Brew the tea, and add sea salt, the calcium, and the magnesium supplement. Add the juice and sweetener, and shake well. Cool and store in the fridge until you are ready to use the sports drink. Your electrolyte drink should be perfect for being on the go. The following simple electrolyte sports drink recipe will take less than 10 minutes to make. It contains a lot of lemon and lime juice to help replenish electrolytes, and some pure honey or maple syrup to give you some energy after a workout. Combine all ingredients until salt and sweeter is completely dissolved. Store in the fridge, and enjoy after a workout. What will you reach for after your next workout? Sports drinks help provide necessary carbs and electrolytes for the body; however, this can be done naturally and without the unnecessary artificial sweeteners, flavors, colors, and preservatives. Although homemade sports drinks may contain natural sweeteners like honey, it is a lot better of an option than neon sports drinks. Daniluk, J., “Hot Detox: A 21-Day Anti-Inflammatory Program to Heal Your Gut and Cleanse Your Body (Toronto: HarperCollins Publishers Ltd., 2016), 138. Wright, C., “Ditch the commercial sports drinks and artificial protein bars – Try economical, nourishing and handmade varieties instead,” Natural News, February 19, 2013; http://www.naturalnews.com/039217_sports_drinks_DIY_recipes_protein_bars.html. “The Dangers of Sport Drinks,” Julie Daniluk; https://www.juliedaniluk.com/health-tips/to-sport-drink-or-not-to-sport-drink.html, last accessed February 28, 2017. Greenfield, B., “Secrets of the Superhuman Food Pyramid: Pros and Cons of Sports Drinks,” Superhuman Coach, March 20, 2014; http://superhumancoach.com/pros-and-cons-of-sports-drinks/. “Adaptogenic Sports Drink: A better way to hydrate,” Empowered Sustenance, June 23, 2013; http://empoweredsustenance.com/adaptogenic-sports-drink/. “Homemade Electrolyte Drink – A Healthy Gatorade Alternative with Four Tasty Flavors,” The Hippy Homemaker, January 8, 2015; http://www.thehippyhomemaker.com/homemade-electrolyte-drink/. “Make Your Own Electrolyte Energy Drink,” Everyday Roots; http://everydayroots.com/homemade-energy-drink, last accessed February 28, 2017. “Natural Electrolyte Sports Drink Recipe,” Wellness Mama, March 14, 2017; https://wellnessmama.com/2575/natural-sports-drink/. Breyer, M., “6 Healthy Sports Drink Alternatives,” Naturally Savvy; http://naturallysavvy.com/eat/6-healthy-sports-drink-alternatives, last accessed February 28, 2017. Black, T., “Homemade Electrolyte Drink – Try This Refreshing Homemade Electrolyte Drink Recipe!” Don’t Mess with Mama; http://dontmesswithmama.com/homemade-citrus-electrolyte-drink/, last accessed February 28, 2017. “Homemade Natural Sports Drink Recipe,” Healthy Holistic Living; http://www.healthy-holistic-living.com/homemade-natural-sports-drink.html, last accessed February 28, 2017.